Offers 230 spacious suites and rooms, luxuriously furnished and tastefully decorated. Whichever of our rooms you decide to choose for your stay, you will be assured of the ultimate comfort, tranquility, convenience and service - just as you would expect from a top international hotel. (A) The 32 King double and 81 twin Rooms measure between 30 and 35 square meters and feature all the standard amenities. All our Superior (A) Rooms have views to Royal Palace and Mediterranean Sea . (B) The 31 King double and 51 twin Rooms measure between 30 and 35 square meters and feature all the standard amenities. All our Superior Rooms (B) have views to Royal Mediterranean Sea and the private beach . The 02 double and 03 twin Deluxe Rooms measure between 35 and 45 square meters and are with private terrace. They are, like all of the 200 rooms of the hotel. The 04 double Junior Suites are located on the 1st & 2nd floors only and every room has its own balcony. Every suite consists of one parlor having dining and living comfortable furniture with guest bathroom connected to a master king size bedroom are quite large and furnished in beautiful colors. The Suite measures approximately 70 square meters. All our Junior suites are overlooking the Mediterranean Sea. The 10 double Corner Suites and are located 2 on each floor form the 1st to the 5th floor. Every room has its own balcony. Every suite consists of one parlor having dining and living comfortable furniture with guest bathroom connected to a master king size bedroom are quite large and furnished in beautiful colors. The Suite measures approximately 100 square meters. All our corner suites are overlooking the Mediterranean Sea. The 2 double Presidential Suites are furnished mainly in soft tone colors and offer ultimate comfort. The adjacent Exclusive Room may be connected to the Presidential Deluxe Suite. The Suite measures approximately 150 square meters. All our Presidential suites are overlooking the front of Mediterranean Sea. 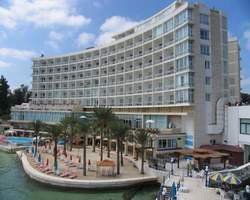 The Pent House Suite, measuring 220 square meters, is the largest suite of the Helnan Palestine Hotel. Through a large ante-room one comes directly into the living room and from there into the elegant dining room and the adjacent library. In addition to a king size master bedroom , dressing room and twin bedded room and kitchen. serve up the finest authentic a’la cart lunch and dinner meals. Offers all kinds of sizzlin' tasty lunches and dinners. Helnan Palestine Hotel Asian Style Restaurant offer a diversity of cuisine selections for all tastes! Using poultry, seafood and beef in combination with special spices. From the lasgna napoletana to the risotta crema , Terrazza uses the freshest and finest ingredients available. Lobsters, Crabs, Shrimp and Fish are the many treasures of the Sea to which Estakoza restaurant bring to our city. The garden satisfies every appetite , with daily entertainment . Light a’ la carte menu and ideal For the afternoon tea , with live entertainment. Helnan Palestine provides multifunctional rooms with the audio visual equipment with different range of capacities, ideal for seminars, conferences, banquet and gala dinners, and even small private meetings. Ranges from 10 to 1000 guests. The easiest way of getting work done!